Two three-year-old fillies will be resuming at Tauranga today, and both are right on target to putting their best foot forward after showing positive signs in their lead up work. Keep On Coming illustrated her readiness with an encouraging trial a fortnight ago at Avondale and will be ridden by Craig Grylls in the maiden 3YO event over 1200m. “She’s come to hand very nicely this preparation and tomorrow’s race looks ideal for her,” co-trainer Pam Gerard said. Keep On Coming is by Shamoline Warrior and carries the colours of prominent breeder and owner Gerard Peterson, and is raced in partnership with Ballymore’s appointed bloodstock consultant Paul Moroney. The second runner on the card is Alakazam who lines up in the maiden event over 1200m, and while her first start last preparation lacked, she has come back much stronger and is another to keep an eye on. 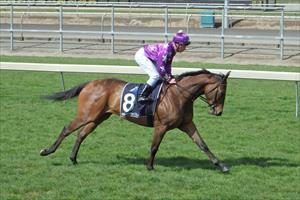 “Couldn’t be happier with her work and from the draw she will likely take a prominent position in the running. She has good gate speed and we will look to make the most of that,” said Gerard.